User Summary: Guess Who? 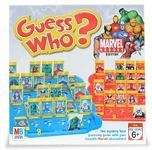 : Marvel Heroes Edition is an edition of Guess Who? with Marvel Heroes and Villains.